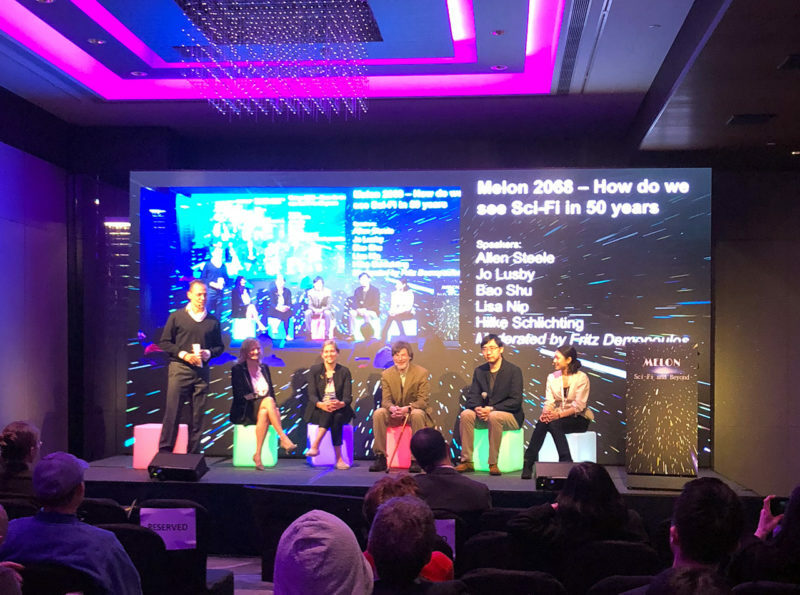 The second Melon festival about “science fiction, innovation and the future” took place in Hong Kong on March 17 and was markedly more packed, slick and diverse than its predecessor. Festival organizers added a third set of speakers – scientists – to their roster this year on top of the previously-featured science fiction authors and media industry veterans. So in addition to entrepreneurs discussing industry trends and writers talking about writing, there were now also scientists sharing details about their life’s work – whether it is to find signs of extraterrestrial life or bio-engineer more durable, space-worthy human beings. All in all, these scientists brought more variety and life to the event, and their presence was a welcome addition. In terms of geographic coverage, festival organizers continued to focus primarily on Mainland China and the West (mostly the US and UK). Though there were signs that they may branch out to include Southeast Asia in the near future: they featured their first ever Southeast Asian author (Zen Cho, who is Malaysian) and invited dozens of new writers from the region, such as Nebula nominee Vina Jie-Min Prasad (who I had to pleasure of meeting at the conference). Despite the improved organization and thoroughly-enjoyable programming, my one gripe with Melon’s second event was that the festival lacked a coherent theme or story (“science fiction, innovation and the future” is a pretty all-encompassing umbrella). One minute, an author would be talking about Asian literary festivals, the next, an entrepreneur was warning us about the non-zero probability of an extinction-level gamma ray burst. Last year’s Melon, in contrast, felt more focused and centered around the sussing out the burgeoning science fiction industry in China and Hong Kong. Last but not least, credit should be given to the festival’s organizers for featuring a healthy balance of women and men amongst its speakers, in fields that have been traditionally (and irrationally) dominated by men. For a blow-by-blow summary of the conference, check out my sketchnotes of the event.